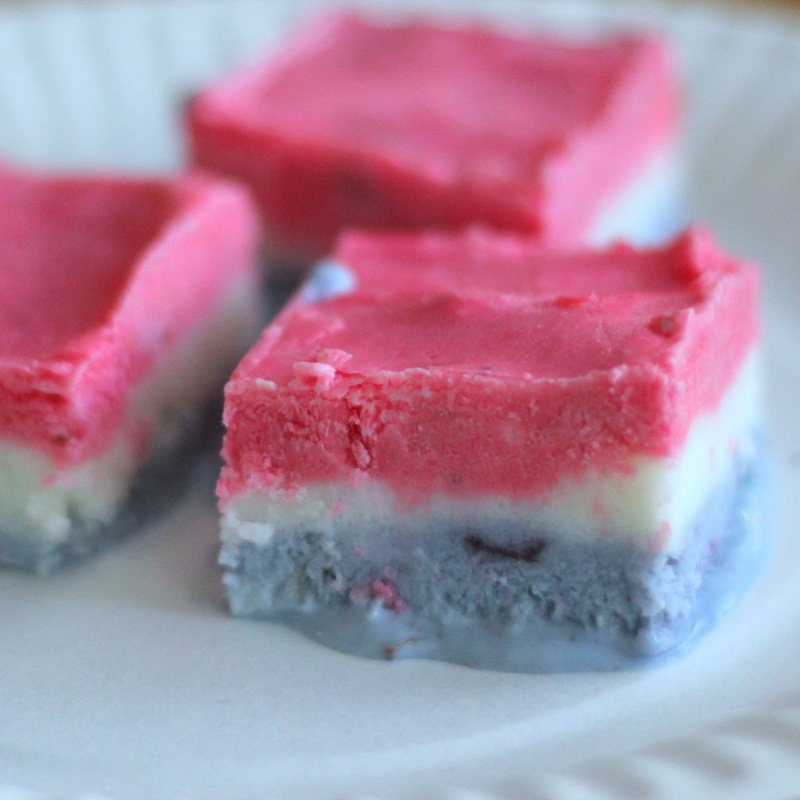 Summer calls for frozen desserts! Usually our first choice is ice cream, but sometimes we actually try and eat a little healthier! Today as part of our A Very Toddler Fourth series we are sharing a simple recipe for Patriotic Frozen Yogurt Bars! 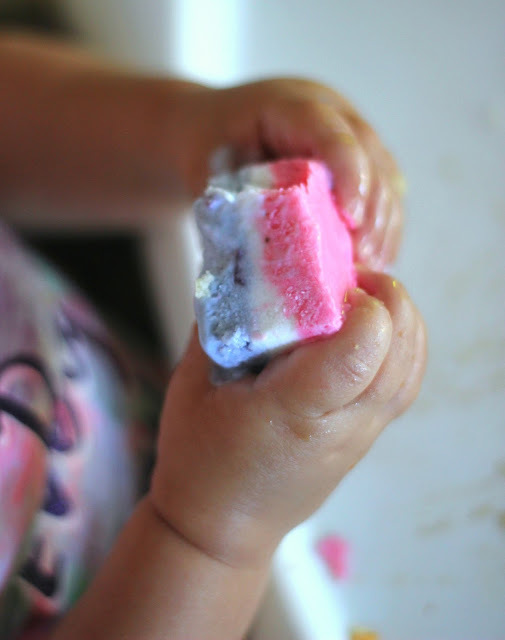 These were a hit at our house and oh so messy to eat too! 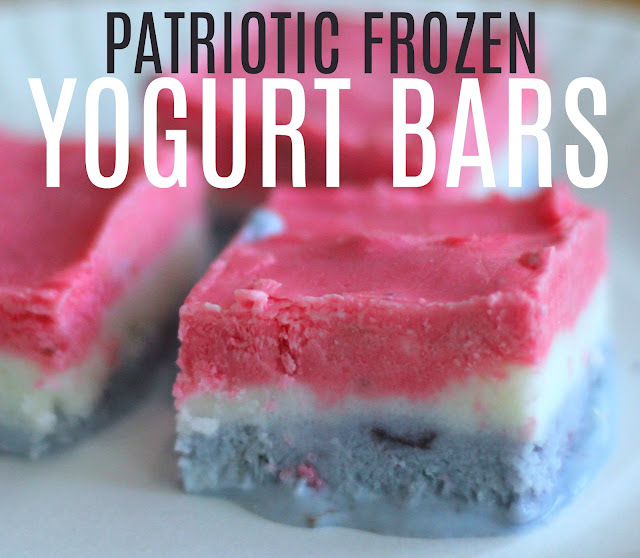 These patriotic frozen yogurt bars only call for a few ingredients and are pretty quick to whip up! To get started you will want to put a layer of blueberry greek yogurt on the bottom of an 8x8 pan. I added a little blue food coloring to my blueberry yogurt to make it a little more blue. Next, put the blueberry layer in the freezer for an hour and let it solidify. Then, add a layer of plain vanilla (white) greek yogurt on top of the solidified blue layer. Let the vanilla layer solidify in the freezer for an hour or two. Finally, add a strawberry greek yogurt layer. I mixed in a little red food coloring to my strawberry yogurt to brighten the color a bit. If you want it to actually be red, you'll need to use even more. The Wilton food gels work the best. Once the last layer is added, return the layered yogurt to the freezer for at least two hours. When the yogurt bars and solid they are ready to be eaten! Grab a sharp knife or server and start cutting! You can grab the bars with your hands and start eating, or you can put them in a bowl and eat them with a fork or spoon. As you can tell, my kiddos were a big fan of these yogurt bars! 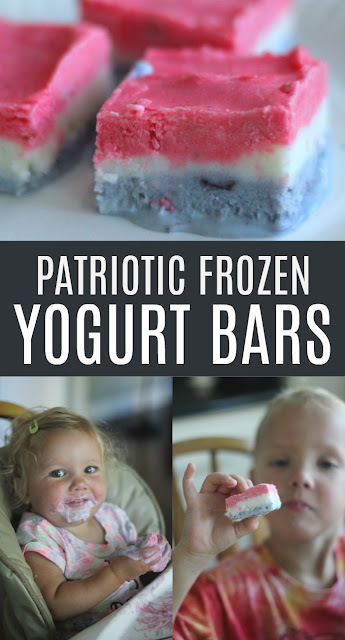 Also, make sure to pop over to I Can Teach My Child to see Jenae's American Flag Ice Painting activity from yesterday and today's activity as well!